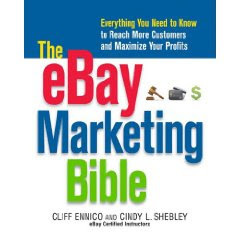 Today I'm happy to introduce Cindy Shebley -- eBay seller, eBay marketing whiz, and co-author of The eBay Marketing Bible. What first sparked your interest in eBay? A friend told me about it - said he found this great little site on the web - must have been around 1997. I checked it out and was hooked. At the time I had a garden shop. We had inventory in the back store room that wasn't selling and I thought I'd give this eBay thing a try.... after the stock room was cleared out I started thinking of other things I could sell. One thing lead to another and now I'm a full time online seller. What do you sell? When I went online I wanted to sell something that was less seasonal than gardening and over time I rediscovered my love of photography. Now, I sell mostly photo lighting equipment, books and tools to help eBay and Online sellers. Where do you find the items you sell? I sell new products, which means I find new suppliers at Trade Shows and through existing sales representatives. Once in awhile I'm contacted by a distributor who found me online. What advice would you have for a new seller? Take a class on eBay or find a tutor or mentor to help you. Setting up a listing is simple, but there is so much more than that, listing strategies, research and even navigating the post office can be difficult. Having someone to show you the ropes will save you time, energy and in many cases money. See how all us animal/pet people end up in the same circle of friends! LOL. GOOD INTERVIEW! Hi Beth, that is so true -- we are definitely a group of animal people who also eBay! I told Cindy I love the phrase "the mayor of Tabby Town" - very cute!